Chiropractic is from the Greek word meaning, “Done by Hand.” Many people believe Chiropractic care is just for back pain. While Chiropractic can help significantly with back pain, this is only the tip of the iceberg. Chiropractic care is really based on the functioning of the nervous system which controls every part of our bodies. The reason that Chiropractors focus on specific spinal adjustments is because the spine protects the spinal cord otherwise known as the headquarters of the nervous system. Protruding off the spinal cord and through the openings on the bones of your spine are nerves which connect to every part of your body. If the nerves are damaged or compressed, it causes dysfunction in the body resulting in pain, sickness, and possibly death. Due to activities in our daily lives like injuries, sports, or even stress the bones in our spines can get out of place causing unnecessary and abnormal pressure on the nerves. When the nerves are compressed, they don’t function properly and this can impact your range of motion or even your ability to get a good night’s sleep! Taking the pressure off the nerves and putting the joint back into proper alignment can help make sure that the nerves are able to do their job! 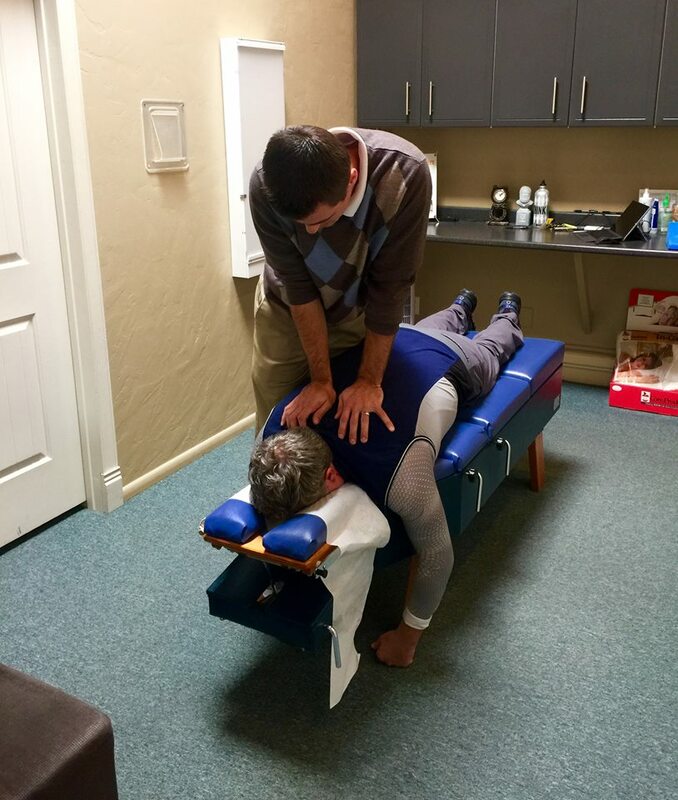 The chiropractor gently adjusts bones into proper alignment so that the body can function as it’s meant to. Our bodies are amazing pieces of machinery. If we get a cut, our body heals it on its own, we breathe without effort, digest food without thinking, and create new human beings without telling the body what to do. Chiropractors do not heal disease, they simply correct nerve interference so that the body can do what it was designed to do. Regular chiropractic care can minimize nerve interference by keeping your spine in proper alignment, leading to sustained health and wellness. Chiropractic care can help with many known health conditions like headaches, chronic pain, and fatigue. Pain and symptoms are generally late stages of nerve interference therefore your spine may be out of alignment without you even knowing it. When your spine or other joints in your body are out of proper alignment, this often creates muscle tension, spasms or cramping which is often what people notice. Moving the bone back in place and restoring function to the joint helps take the pressure off the surrounding muscles resulting in less pain and tension. A chiropractor may do some soft tissue work to further assist in your healing as well. Many people visit chiropractors because they are struggling with an issue whether that be back pain, headaches or any number of conditions. While a chiropractor can help with those issues and a variety of others the true goal of a chiropractor is to help each person prevent pain, sickness, and disease before it occurs. Instead of simply treating symptoms, they work to find the root cause of your issue. Pain or obvious symptoms may not always be present when you have interference in your nervous system. It’s important to pay attention to subtle cues and listen to your body. In many cases the problem is there long before any pain or obvious symptoms are present and once they are it can take much longer to restore your body to health. Changing the way you think about your health care is the first step to achieving true health. Take steps today through nutrition, increased activity, positive thinking, and chiropractic care to prevent problems before they start and maintain your health now and in the future.